Charley Castex charleycastex.com Thanks to the Sign Guy (Bob Potter) I had signs up lickety-split! Waited two weeks with no art work to even consider, from his competition. Save yourself some heartache, just call Bob first! Bree Welmaker Huntington Chase HOA Our neighborhood sign needed repainting and some mortar repair around the stone work. Bob was very prompt in returning my call and in all of his communication with me throughout the project. I really appreciated how he kept me informed about the progress on the sign repair and update as well. His work was meticulous, and the Home Owners Association is very pleased with the result. The sign is beautiful! We highly recommend Bob for his work and professionalism. Sheriff George H. Erwin, Jr. (Retired) Oak Forest Baptist Church Our church members wanted an electronic sign and I started researching the cost. I was amazed at the cost and variations. The least expensive I found was $15,000 and had to be ordered. We then would need to have it installed. By a God Wink I was at Bob Potter’s Shop (The Sign Guy) in Skyland for some other church business. I noticed LED signs. 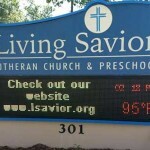 I have known Bob for sometime and I asked if he does LED signs. He said he does.I asked if he would look at our sign and just replace the billboard portion. Bob called me and gave me a completed price of $7,000. (We chose blue, red & purple LED) I did not want to include this in our church budget, so we had a church yard sale, golf tournament and love offering to make up the difference. We are thrilled with Bob, the customer service and of course our new sign.I share this with you, as we are a small congregation and if we can be blessed with an LED sign, other small congregations can as well. We see the sign as a way to minister to the community through the messages we post. John Foreman – I live in Arden. I tried unsuccessfully to get signs made at Sign-a-Rama and Tri-County Sign Solution. Each business proved to be a waste of my time and unprofessional to say the least. Bob Potter, on the other hand, was prompt, professional and pleasant. I would highly recommend him. Shelia Fletcher Storage Center Bob Potter has been doing work for our company since 2006. He is professional and punctual at all times. He is always willing to work with you if you have a deadline. His work is beautiful and he takes pride in it. We are always pleased with his finished work, I would recommend him highly. Emma Bus Line Co., LLC We here at Emma Bus Lines truly enjoy Bob Potter “The Sign Guy”. We have called on Bob for around 6 years now to do the lettering on our vehicles. We run a charter company and have a fleet of school buses, motor coaches and vans. In which “the Sign Guy” has lettered them all. We most definitely highly recommend Bob for all your sign needs. Kelli Brown Mullinix Gutter Helmet WNC/Two Day Bath & Shower Bob recently made magnetic signs for our vehicles and aluminum signs for our businesses. From start to finish he was professional and prompt. His prices are great and his service is exceptional. I highly recommend him for all your sign needs! Steve Cottle Stevens Transportation For almost 20 years the Sign Guy, Bob Potter has provided consistent quality on-time grapics for us. He can do anything to enhance a company image. With his professional approach and cutting edge technology we have grown as a business. Image through signage is all important to a business and the Sign Guy delivers. Bob will also make suggestions on ideas and provide the best solution at reasonable rates. 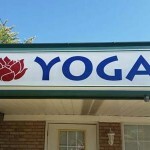 Over the years we have done business with the Sign Guy we have used various media: Lighted Signs, Magnetic Signs, Vinyl Lettering, 3D Imaging, and both Flat & Reflective Lettering with great results. Wayne Patterson Owner Carolina Blinds Bob Potter has been designing excellent signs and lettering for our company for over 15 years. I’ve gotten many new customers from the lettering on our vehicles. His consistent, quality workmanship has been a tremendous tool in branding our window covering business. He has also helped us to design billboard wraps and logos. His expertise has given our company a very professional image. Bob has always taken care of our sign and design needs promptly and in a friendly manner. Paul L. Dermid III Franchise owner Scotts Lawn Service of Asheville, LLC Scotts Lawn Service of Asheville, LLC has used The Sign Guy for the past three years. He has always done outstanding work for us. He has put on our decals for the Scotts vans and trucks, made signs, and we have not had to wait weeks for him to do the work for us. I would highly recommend him to anyone for fast and high quality sign work. Melissa Arden Mini Storage/Lake Julian Mobile Home Park We have had work done by The Sign Guy for many years and he has always been professional. We have had lighted signs, car magnet signs, portable signs, and car tags and have been happy with them all. Groundskeeper Lawn Care Co. Asheville-Hendersonville, NC I have used The Sign Guy for the past six years and would recommend him to anyone looking for a high quality product. Bob has made yard signs for me to post in my customers’ yards. He has done all the advertising lettering on my trucks, cars and baggers that go on the backs of mowers. Bob Potter has always went the extra mile for us to ensure the highest quality, and the fastest turn around time so we would not have a lot of downtime. Richard Cicchetti Something To Bark About | 875 C Tunnel Road Asheville, NC Bob came to our business, gave us great ideas and a reasonable price. The signs he installed created four new customers at our dog grooming salon in the first week. He is friendly and professional and goes the extra mile for his customers.